NextDatabase Pagination: Using OFFSET and Keyset in N1QL. In the previous post, we saw some of the challenges of implementing distributed transactions and how to implement Saga’s pattern using the Event/Choreography approach. In this article, let’s talk about how to address some of its problems like complex transactions or cyclic dependencies of events by using another type of Saga’s implementation called Command or Orchestration. In the orchestration approach, we define a new service with the sole responsibility of telling each participant what to do and when. The saga orchestrator communicates with each service in a command/reply style telling them what operation should be performed. 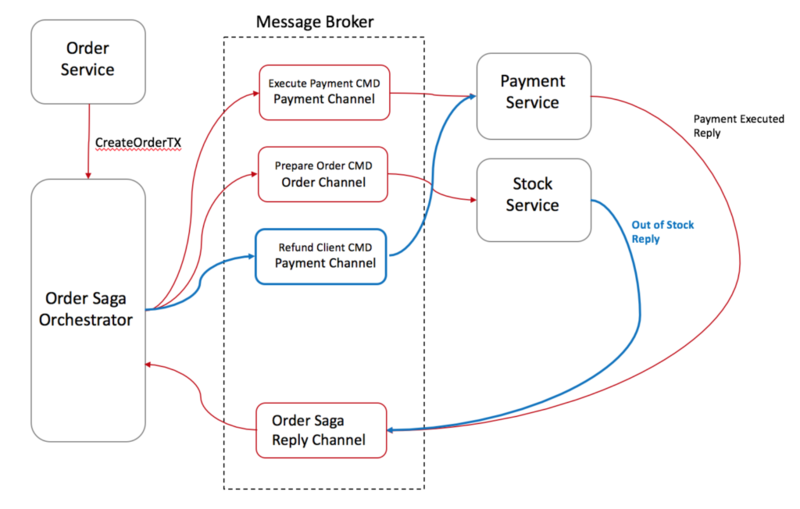 Order Service saves a pending order and asks Order Saga Orchestrator (OSO) to start a create order transaction. 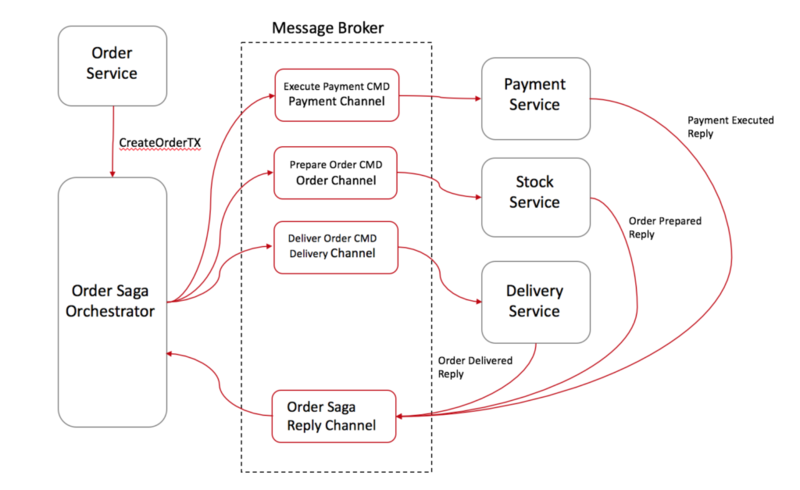 In the case above, Order Saga Orchestrator knows what is the flow needed to execute a “create order” transaction. If anything fails, it is also responsible for coordinating the rollback by sending commands to each participant to undo the previous operation. A standard way to model a saga orchestrator is a State Machine where each transformation corresponds to a command or message. State machines are an excellent pattern to structure a well-defined behavior as they are easy to implement and particularly great for testing. Reduce participants complexity as they only need to execute/reply commands. If you have a second transaction willing to change the same target object, you can easily put it on hold on the orchestrator until the first transaction ends. However, this approach still has some drawbacks, one of them is the risk of concentrating too much logic in the orchestrator and ending up with an architecture where the smart orchestrator tells dumb services what to do. Another downside of Saga’s Orchestration-based is that it slightly increases your infrastructure complexity as you will need to manage an extra service. Having a unique identifier for each transaction is a common technique for traceability, but it also helps participants to have a standard way to request data from each other. By using a transaction Id, for instance, Delivery Service could ask Stock Service where to pick up the products and double check with the Payment Service if the order was paid. Instead of designing your participants to reply to a fixed address, consider sending the reply address within the message, this way you enable your participants to reply to multiple orchestrators. If you are using queues for communication between services (like SQS, Kafka, RabbitMQ, etc. ), I personally recommended you make your operations Idempotent. Most of those queues might deliver the same message twice. It also might increase the fault tolerance of your service. Quite often a bug in a client might trigger/replay unwanted messages and mess up with your database. As the transaction goes, don’t forget to add into the message all the data needed for each operation to be executed. The whole goal is to avoid synchronous calls between the services just to request more data. It will enable your services to execute their local transactions even when other services are offline. The downside is that your orchestrator will be slightly more complex as you will need to manipulate the requests/responses of each step, so be aware of the tradeoffs.